Hazy cafées full of people and the sweet odor of the burning plants oozing to the streets. In the middle of the bright daylight half-naked ladies are seeking for the next customer through the vitrines. Despite the odds of Amsterdam I did like it. Amsterdam has two sides. One side consists of all the things that are legal only in Amsterdam and the other part promotes healthy living and people crazy for cycling and order. This combination makes Amsterdam an intriguing destination. The land famous for windmills – they are so lovely! I did like to cycle in Amsterdam. It’s easy, convenient, there are really good cycle paths and no hills to climb. I even took a cycling tour even though it had been two years since the last time I even touched a bike and it turned out to be awesome. I stayed in Amsterdam Teleport Hotel which offers free alternative street art cycling tours for the hotel guests (you can rent bikes from the hotel either only for the tour for 10 € or for 24h 15 €). The tour lasted two hours and I learnt so much about street art and I saw a lot of places where the normal tourists don’t find their way to. 100% recommended! The tour started from the hotel and after the tour you were able to stay in the city center if you wanted to – how convenient! The bikes in Amsterdam are so unique! Amsterdam is full of different events ranging from sport events to nightclub gigs. I went to one techno party in a club called Melkweg. I’m not a fan of techno music but I did like the venue. I was also invited by UltiSports to an ultimate frisbee tournament called Windmill. I’ve played ultimate frisbee for 10 years – yes, you heard me right TEN years – so it was awesome to be able to be part of the event! The atmosphere was pure greatness and it’s one of the biggest tournaments in Europe. Everyone loves the same sport and you could feel like you were a part of a great big family. The games were really entertaining: tough but good spirited. There were different activities in the tournament as well such as trampolines, twister bouldering and drinking games. For me the crown of the event was the evening bonfire on Saturday where everyone got to gather for some good banter. The tournament was three days long and I stayed there appoximately one and a half days. I suggest anyone to visit that tournament even if you don’t play the sport. It is really something else! Windmill – THE ultimate frisbee event of the year! I felt Amsterdam also a bit stressful. I was the blond girl wandering alone so I found too much interesting company (apparently wearing a leather jacket makes me a stripper). Also the first shock of accidentally wandering through the Red Light District brought up the idea that I might be in the wrong place alone now. I knew about the legal stuff in Amsterdam before I went there of course but still the legality of prostitution and smoking weed was confusing. I had a great time! Amsterdam is a beautiful city with glittering canals and cute little houses. I felt like in 3 days I managed to explore the city centre and I basically had to leave all the museums for the next time. 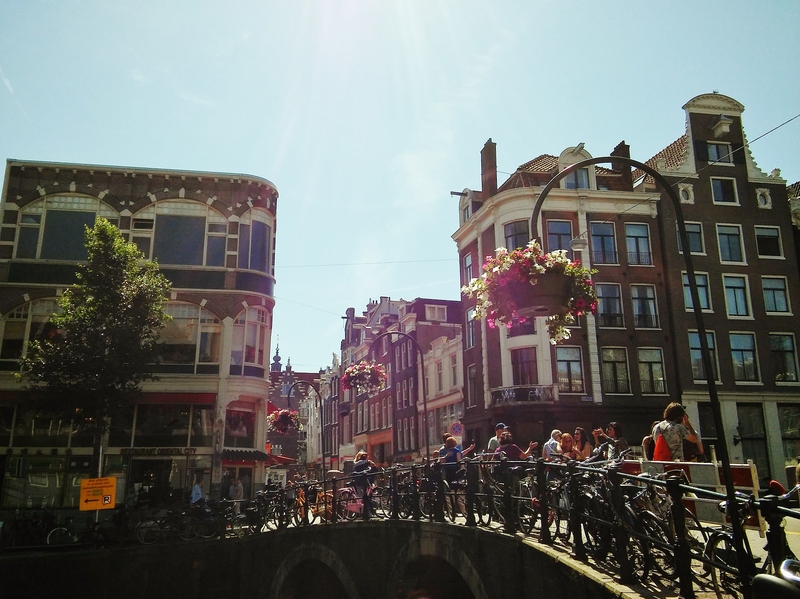 I loved the canals so much that I used most of my time seeking for a more beautiful one even though I knew Amsterdam has also many other things to offer. It’s always good to save something for the next time. My recommendation for a good restaurant if you are a Japanese food lover and you like ramen is Fou Fow Ramen near the centre. The restaurant was almost full during the afternoon so prepare to wait a bit or make a reservation – it’s a popular place! As a dessert I got the best apple pie in café Winkel43 which I totally recommend. It also has a nice terrace where to sit if it’s a warm day. Amsterdam is full of these small gelato and cake cafees – so yummy! The locals suggested also another good Japanese restaurant Take Japanese Kitchen in the center. I’ve heard that for dessert Van Stapele Koekmakerij has the tastiest cookies in town so go and check it out. If you’d like to go to take a few drinks the locals suggested going to the Hanneke’s Boom. If you want to visit a very up and coming area then head to Noord. The whole “NDSM” area is former industrial area that has now some really nice bars. Check out for example Pllek or Noorderlicht which has a beautiful view of the city, especially at night. If you want to sleep like a baby on a soft mattress and feel very welcomed by the staff I highly recommend choosing Amsterdam Teleport Hotel. The location of the hotel was convenient, just only five minutes walk to the Amsterdam Sloterdijk train station with frequent connections and only one stop to the centre and two to Schiphol Airport. The hotel also rents bikes 15€ per day which is also a good choice for reaching the centre or just to explore the neighbourhood. It takes around 15-20 minutes to cycle to the city. I really loved the beds of this hotel – super comfy and I slept so well. I’ve got used to rock hard hotel beds so I was gladly surprised that they were comfortably soft! The fridge was also one of the biggest ones I’ve seen in a regular hotel room and it also had an ice box which is rare. The walls of the room are decorated with street art! There is a different piece of art in every room. I also enjoyed the versatile breakfast which is 10 € per person. There’s a variety of cheeses, fresh juices, fruits and the freshly baked omelette of your choice. There’s a good vibe around the hotel especially thanks to the staff and if you’re looking for an affordable stay with a great location and good room amenities Teleport Hotel could be also your choice. If I have a creature in my hotel room it must be as cute as this one. Think twice if you need the card for the public transportation! The price is bareable – 3 days ticket costs a bit over 30 € if you include the airport train. I did use the ticket frequently. I took the train from Sloterdijk station to the center and then walked around. But especially if you choose the hotel in the center of Amsterdam you don’t need the travel card. Cycling is convenient in Amsterdam – the infrastructure is built for it! Just remember to stick to the right and keep to your lane, otherwise accidents might happen. Bonus tip: Download the offline map for Amsterdam called Amsterdam app. Works really well and helps you not to get lost to the jungle of similar looking canals! I fell in love with the canals of Amsterdam. Looking for a weekend escape for some city holiday? Check out my tips for beautiful Lisbon! Thank you so much! I’m really glad to hear that you liked it! “I found too much interesting company” 😂That’s one of those things I don’t like about traveling alone because it happens all the time. Unfortunately. It does sound like you had the time of your life. Great tips! I’m excited to visit again after reading this! Haha..so true! But it was surprising for me how much I got that kind of attention – it’s not a new thing just the amount was 😀 I did enjoy my time in Amsterdam! I didn’t get lost as much as I feared. Thank you, I’m really glad you liked! Thank you Cindy! 😊😊 You are awesome! Sounds like an amazing trip. My husband is Japanese and would love to check out Fou Fow Ramen when we make it to Amsterdam. We are going to be close (In Germany) next year, but prob won’t make it that far north. Hopefully on a future trip. Thank you for sharing. I hope you’ll get the change to visit Amsterdam, it’s a beautiful city! 🙂 I hope your husband will enjoy Fou Fow Ramen. I really enjoyed the food there but I’m not sure how a Japanese will find it. 🙂 At least all the staff were Japanese and the restaurant was crowded – that’s a good sign! Thank you so much, I’m so glad you ejoyed reading my article! 😀 I fell in love with Amsterdam on my trip too!